(Phys.org)—In nature, some organisms use deformations to create three-dimensional movement. One example is the Venus fly trap, which opens and shuts its leaves to catch prey. When open, the leaves are concave, but when closed the leaves are convex. Scientists are interested in mimicking controlled deformations for applications in soft electronics or actuators. Researchers from Zhejiang University in China, Iowa State University, and Hokkadio University in Japan have used periodically patterned hydrogels to mimic the kind of cooperative deformations seen in nature. These hydrogels spontaneously deform into three-dimensional concave and convex configurations that are guided by nearest-neighbor cooperative effects. Their work appears in Science Advances. Hydrogels are flexible polymers that absorb water, some of which are high-swelling while others are low- or non-swelling. For this study, Wang, et al. used photolithography to do a two-step photopolymerization process to create a two-dimensional array of alternating hydrogels. They began by placing PAAm, a non-swelling gel, in a certain pattern in which some of the gel is exposed to UV light. Then, a high-swelling gel, P(AAm-co-AMPS), was overlaid on the newly patterned non-swelling gel, which was then exposed to UV light. This created an alternating pattern of two gels that upon swelling, resulted in alternating concave and convex deformations in the high-swelling gel discs. Deformation occurs because high-swelling regions are constrained by the non-swelling regions causing the high-swelling regions to buckle. To minimize global elastic energy, the high swelling regions alternate between concave and convex deformations. The alternating pattern among the high-swelling discs demonstrated a cooperative effect in that neighboring high-swelling discs seemed to "know" whether their neighbors were concave or convex. To understand the cooperative effects of the hydrogel discs, Wang et al. varied inter-disc distance as well as the disc radius of their gels. They found that in order to see cooperative effects, there is a certain special distance, called the cooperative distance, at which the hydrogel disc domains become cooperative. At lengths greater than this distance, they did not observe cooperative effects. The nature of these deformations, including the cooperative distance, can be controlled by modifying several factors. For one, the radius of the individual high-swelling discs effects the cooperative distance. Furthermore, differences between the hydrogels' swelling abilities can change the geometric pattern. If the hydrogels do not exhibit a large swelling mis-match, then they will form a rhombic pattern with the high-swelling disc in the middle surrounded by four non-swelling discs. If the gels are a have a large swelling mis-match, then the non-swelling discs form a triangular geometry around the high-swelling discs. These geometries can be controlled by changing the ionic character of the solvent solution. For example, a hexagonally-arranged patterned gel with a disc radius of 5 mm and distance between discs as 15 mm, demonstrated triangle-shaped deformation when swollen with pure water. However, when 0.15 M NaCl was used, the hydrogel sheet flattened. It demonstrated a rhombic shape when 0.02 M NaCl was used. Additionally, Wang et al. showed that you can manipulate local regions of the hydrogel by doing selective pre-swelling. This is done by masking some of the discs from coming into contact with water or saline solution, which results in the non-masked areas swelling while the masked ones do not. Using differently-shaped masks, the authors showed that changing the shape of the individual hydrogel discs to squares or ellipses changed the localized buckling shape. However, the gels still maintained their cooperative effects. 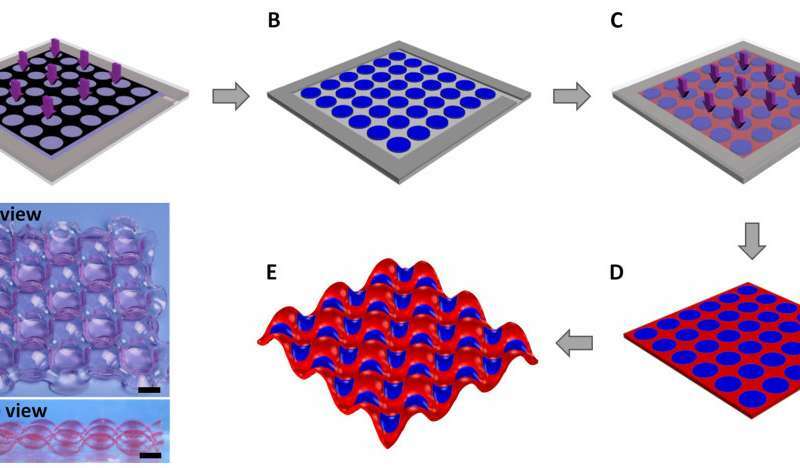 Their studies showed that by tailoring the hydrogel patterns, one can obtain complex cooperative deformations. Lastly, the authors considered the periodicity of their patterned hydrogels. Dispersion periodicity can be changed by layering different gels using different masks. In this paper, PAAc and P(PAAm-co-VI), discs were placed in P(AAm-co-AMPS) gel. These gels responded differently at different pH. Two of the gels swelled at pH 2, forming the concave-convex pattern. At a pH 10, one of the swollen discs did not swell, while the other two did. This stimulus-triggered cooperative deformation pattern was relatively reversible and can be further tailored using different hydrogels. This work demonstrates the idea of cooperative deformation using periodically patterned hydrogels, providing a proof-of-concept that should be generally applicable to other materials.